Today Kezia Dugdale tries (again) to carve out a niche in the world for her herself and her dying tribe. Yet more powers? Again? Today she argues for a “new Act of Union” to “safeguard our family of nations”. Like a small child watching the water drain out of the bathtub she is left sitting in a constitutional puddle. As the constitutional shambles of Brexit unfolds daily, and the palpable contempt of the Supreme Court ruling is revealed, it’s perhaps unfortunate timing for Dugdales’s Big Speech. 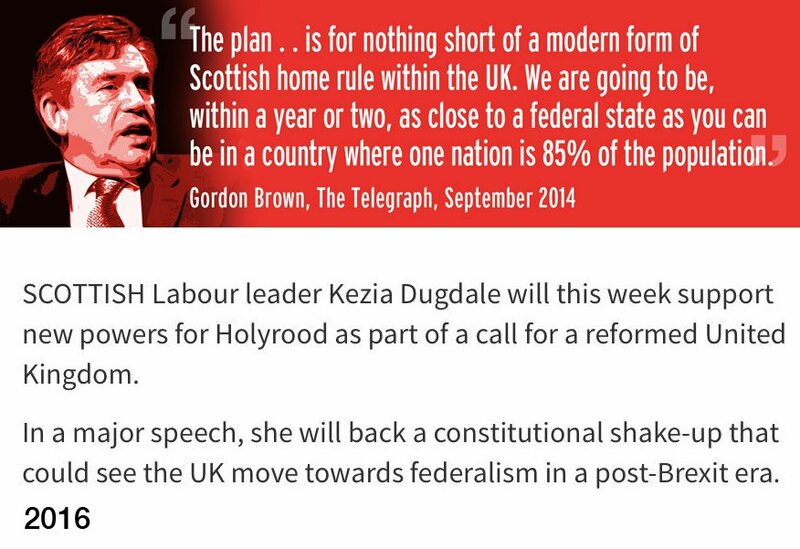 If a political heavyweight like Gordon Brown couldn’t and can’t deliver his own “Vow” – then the chances of Kezia Dugdale, from a deracinated Scottish Labour Party offering anything seems slender. The idea of Scotland leading the rest of the UK in constitutional politics is a nice one. But it’s one that fell into disrepair the day after the independence referendum, when David Cameron re-framed the constitutional question as about EVEL, an issue stoked by an entirely fictitious sense of misplaced grievance and false victimhood and confirmed again yesterday when the Supreme Court ruled that devolution was a passing whim of little relevance or legal standing. This is Kezia’s Brownhog Day. She has written a letter to Theresa May outlining her plans. It has always been apparent that power devolved is power retained. As we should expect, the Supreme Court will make it abundantly clear that the sovereignty of Scotland is at best contingent, at worst irrelevant to the Brexit decision, which will be subject to a Westminster parliamentary vote, I’d wager. What is so wrong about breaking up the UK now? It appears Scotland has nothing to lose. Time also for Labour rebels to vote against the amendment put by the government to facilitate triggering of Article 50, which the Law Lords have already indicated will not be sufficient to trigger Brexit in any case. Labour’s best hope of winning any seats in the next general election is to stand up and vote down the May government, arguing that it is clueless and that only a Labour-led government can deliver a socially just outcome. This would enable it to align with the SNP-led Scottish government, and promise to devolve those powers denied it by the Tories despite the vow, with an agreed timetable to a second referendum test which would also offer a third choice of this, let’s call it, devomax option. Old hat? Perhaps from a Scottish perspective. But it is a strategy which could aid a broken Labour and prevent the Tory right using post-Article 50 powers to destroy decades of progressive legislation. Ultimately this would allow for an election where an anti-Brexit SNP would consider coalition with anti-Brexit forces, or even proi-single market forces, with a view to securing the best best deal for Scotland. Never happen , and this time its not Slab saying it. Slab are on a extinction level even course in Scotland , In England however they seem to be making ground under Corbyn with the disenfranchised socialists – as the rest choose ukip , a little like the yoons in Scotland jumping ship to Tory in order to keep the standard flying over Scotland. One thing must be ran up to Sturgeons inbox from Scotland – If we want indy stand every single councillor in next MAY election on one mandate , a vote for the SNP is a vote for indy. I dont think that project fear would bankroll SLAB and Tory better together II for a council election…. and as a result the last of SLAB would have to act on the head of the beast that carried on Nulabour in Scotland even as Broon has changed tack. I don’t see Labour making much headway in England. They came fourth in a by-election recently. Corbyn’s polling numbers have been consistently bad, and that is before the Conservatives get to replay his back catalogue during an election. I don’t think Labour return in Scotland until they’re a separate (though perhaps affiliated) party. At the moment, at best, they’re like Michael Howard-era Conservatives vs New Labour. Not having a telly, I had missed the May comment until now…….I am struck by what it is about the absence of critical thinking and the extent of nationalistic conditioning re people living in England that this was not treated with universal derision. I actually feel quite sad about how embarrassing this is for Kezia. Bella rightly refers to Labour having been torn up from its roots, but there it still has some residual institutional infrastructure that feels it has to keep flogging away to justify itself. Bella has made reference in the past to the undertaker and the midwife strategy for a new Scotland……the undertaker obviously to bury Labour. The next major milestone is to remove Labour’s mafia like grip from George Square. I do hope the Glasgow Greens and the SNP can optimise the STV system to secure this…….rather than risk the unseemly sight of a Glasgow Unionist alliance……….and maybe rename George Square as Mary Barbour Square? Tis a good idea about Barbour , perhaps we could place a vintage tank there also with a Blue traffic cone on it , but I fear as long as it sits in front of a Labour council building that has lost its socialist routes would be an insult to the woman. – note, not ‘and England’ but ‘and the English regions’! Just what is she giving Scotland parity with, there? It looks like colonial mindwarpedness, to me. I recently heard the 2014 Indy referendum referred to in the words ‘Sturgeon had her regional vote’. Is Scotland seen by Kezia, too, as just a region – not a country? Sadly Dugdale really is the most inept leader of any of the political parties at Holyrood since its inception,regurgitating Browns “Federal union”cold kale shows how Dugdale and Slab have completely lost the plot,the sooner this defunct husk of a party is laid to rest the better for Scotland! There wont be a job for her come May , and no one is wanting to take on the role other than Jackie “final nail in the Slab elect-ability coffin” Baillie. In around 20 years labour in Scotland has went from the perty that had to weight its votes to that of irrelevance and empowering the yoons , while losing votes to them under the regional list and FPTP. But somehow cannot do the maths that the voters have changed while they have not. Even Broon has jumped ship – the biggest rat of them all on the people of Scotland , pity he sold off the North sea to his English masters. So in other words the SLAB Councillors , the unemployed politicians as a result of the indy BT campaign and the few car carrying members that are left , are YOO feart to organise a coup , and by the time they do well there wont be many left to do so. Perhaps its time to set up a crowdfunding campaign for the fecking headstone , before it becomes one of PFI where we pay 3x the amount and the costs of the quango on deciding the wording on top.